10+ Easy Tips To Make Your Hair Grow Faster! You may love your pixie or that high-low bob to whatever extent, but when you are about to get married, every girl wants to sport long hair. Even if you usually rock a pixie cut, chances are that most of you would happily ditch that to grow your hair for your big day. 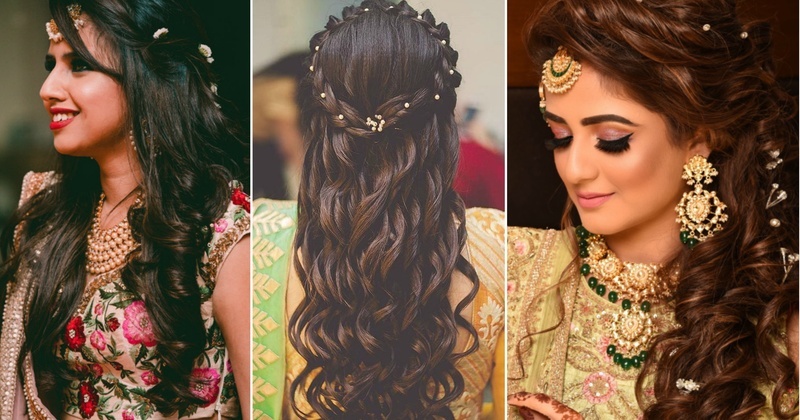 Of course in today’s time there are a lot of newer options out there like extensions and wigs which blend in so well, but if want all the hairstyles done on your natural hair then then there is a list of things you need to follow to make sure to get those long locks for your wedding day. Here are some tips which will make sure that your hair grows back faster and longer for your wedding. Inspite of whatever you might've heard, constant trimming of your hair isn't good but neither is ignoring it completely. Your hair grows by half an inch every month and you won’t want to chop off all that progress. Although, at the same time, a split end can travel up the hair shaft causing your hair to break off, which isn't good either. Pro tip: Give your hair a slight trim every three months to cut away dead ends without stunting growth. Be a little kind to your hair! Try to avoid harsh chemicals and limit the number of times you shampoo and condition your hair to just twice or thrice a week. Cleansing your hair too often can strip your strands of natural oils, making them prone to breakage. Pro tip: You can avoid oily roots by brushing your hair a few times a day with a natural bristle brush—it distributes oils down the hair shaft and helps you fight the temptation to wash. If you cannot avoid using your shampoo too often, we suggest avoid the shampoos that have silicone as an ingredient. The purpose of shampoo is to wash away dirt and product buildup, but the ones with silicone can take away essential natural oils that keep strands soft and healthy along with it. Silicone coats your hair, which effectively blocks out nutrients and prevents hair from getting the proper nourishment to grow long. It might be more expensive, but buy shampoos and conditioners without silicone in the ingredient list. Pro tip: Wash your hair less, so it will all even out in the end. 4. Use conditioner every time you shampoo. If your hair is wet, that means you have to condition it. Over time, from coloring and heat styling, strands start to get thinner at the bottom and conditioner helps provide nourishment to the hair shaft. It also seals the cuticle to prevent more damage from happening so that you can get your hair to grow longer and look healthier. The healthiest diet for your hair is a healthy diet in general That diet will include real, whole food and mostly plant-based. Leafy vegetables, beans, seeds, lean fish, and chicken are all excellent sources of nutrition and form that healthy diet. Pro tip: Add foods rich in iron, zinc, vitamin C, B vitamins, and omega-3 which are most commonly linked to stronger and longer hair. The weather can wreak havoc on your hair too! Exposure to UV rays from the sun can strip your hair down and cause a lot of damage over time. Also, if you are a swimmer, with all those dips in the pool, the chlorine will dry your hair out, making it more brittle with time. Pro tip: Always wear a hat outside and rinse your hair with fresh water immediately after a quick dip in the ocean or pool. You may think that blow dryers, curling irons and flat irons keep your hair frizz free, but what actually happens is that they fry your hair strands and make them more frizzy. So, for healthier locks, air dry your hair whenever possible and never brush or sleep with wet hair. Damp strands are prone to more damage. Pro tip: Detangle damp hair with a wide-tooth comb and gently squeeze excess water out with an old T-shirt for a less-rough approach. The best way to keep your hair moisturized and healthy is to stay hydrated. Drinking lots of water helps push toxins out of your body and promotes hair growth. Rubber bands, clips and pins may seem like a simple solution to a bad hair day, but pulling your hair back into a ponytail can actually cause more damage to your hair in the long run. Pro tip: Leave your hair loose and avoid pulling it back, especially when it's wet and you'll notice a difference over time. It might sound counterintuitive to put oil on an oily scalp, but a hot oil massage can breakdown scalp buildup and stimulate hair growth from the roots. A quick way to do this at home is to apply either coconut oil or jojoba oil to your scalp before you get into the shower. Pro tip: Let the oil sit for 15 minutes in the steam from your running shower—rub it into your scalp—and then wash it out with shampoo. You would be surprised to know how many items in your kitchen are good for your hair. Pro tip: Rinsing your hair weekly with either an apple cider vinegar, onion water, palm oil or grapeseed oil will help promote hair growth and keep your strands silky and healthy. Constant brushing can cause physical harm to your hair and your hair will start falling out. Pro Tip: When you detangle wet hair, be sure to start from the bottom and work your way up — we often instinctually go from the scalp down, but that just brings small tangles into one large knot and can cause you to lose a lot of hair. It sounds like an unnecessary luxury, but sleeping on a silk pillowcase can actually help your hair grow long. Cotton or linen fabrics can pull or tug at hair, causing it to break while you're tossing and turning at night. Silk won't cause any unwanted friction, so your hair remains smooth and knot-free in the morning. A cold water rinse at the end of each shower really does help to grow hair. Cold water lays down the outer layer of hair more smoothly, which helps prevent moisture loss, snags and heat damage. Pro tip: Only for a few seconds is enough and always remember this one extra step over time can make a huge difference. Have you been taking special care of your hair, treating it delicately, and still not seeing the growth results you wanted? Well, how would you? Your high stress levels won’t let it happen. High stress is a common cause of hair fall, and that means your hair strands won’t grow to their full potential. Stress, caused due to physiological or psychological factors, negatively affects the health and growth of hair. It makes your hair lose its density and volume and makes it look dull and malnourished. Pro tip: Practice yoga, meditation and other stress relieving exercises while also ensuring you get at least 6-8 hours of sleep every day.